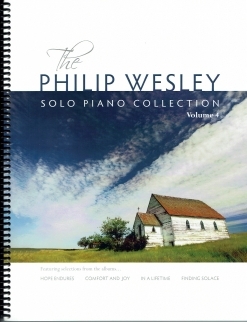 The Philip Wesley Solo Piano Collection, Volume 4 is a compilation of eleven piano solos from four of Philip Wesley’s piano albums: Hope Endures (5), Comfort and Joy (3), In a Lifetime (1), and Finding Solace (2). This volume includes arrangements of two hymns and two Christmas carols (see titles below), so some of this music will be familiar to just about everyone. None of the pieces are very difficult - pianists at an upper-intermediate and early-advanced playing level should have little trouble mastering this music. The pieces have a full sound and are fun to play. 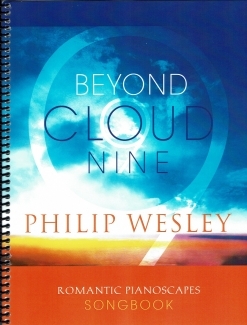 The books are spiral-bound and printed on a medium-weight bright white paper stock. Some of the pieces have the phrasing marked and most have metronome settings and suggested pedaling. The music is well-spaced and easy to read. There are a few reaches of a tenth, but not many. 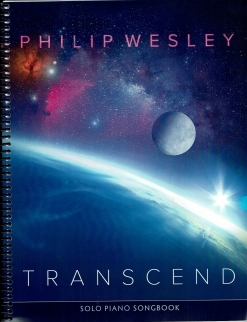 The front and back covers are full-color, and the book includes a bio and discography of Philip Wesley. 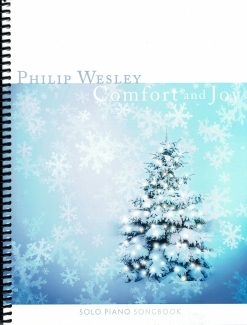 Philip’s songbooks and sheet music downloads are currently available exclusively from www.PhilipWesley.com. Recommended!